A great patron with wide-ranging interests, Shah Abbas (reigned 1586-1628) is best known for his architectural transformation of Isfahan. Already the richest city in the empire, Isfahan became a major artistic and cultural center under Abbas's patronage. Because he was interested in developing arts that were important for trade, the shah established workshops throughout Persia to produce textiles, rugs, and ceramics. From these state-supported industries came luxury objects that were essential economic assets to compete with Chinese and other foreign goods in the domestic and the export markets. 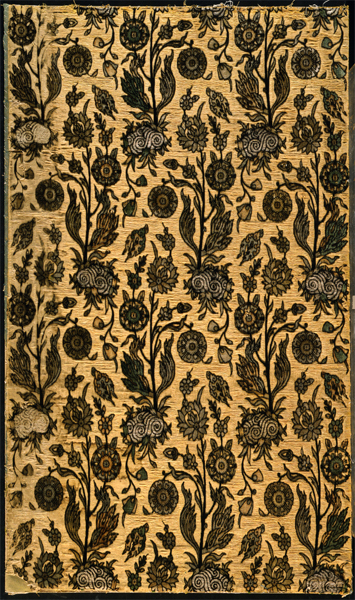 The elegant taste of Shah Abbas's textile workshops is evident in the use of precious materials- silver and gold- and complex weaving techniques. Patterning this silk fragment is a large flowering plant growing out of a tiny "pond" in schematic wavelike form. Rhythmic and fluid in their combined effect, the individual units create an undulating surface design of subtlety and grace.